The Wawa Salmon Derby Incorporated and any proprietary right such as promotion, sponsorship or advertising belongs to and is the property of the Wawa Salmon Derby Incorporated. The Rules and Regulations for the Wawa Salmon Derby are governed by the Board of Directors (hereinafter referred to as “Derby Officials”) of the Wawa Salmon Derby Incorporated. Time of Derby will be 5:00 pm Friday to 1:00 pm Sunday. In the event of unsafe weather conditions resulting in no salmon fishing on Lake Superior, prizes will be awarded by drawing team tag numbers. The boats that are tied to pins in Michipicoten River will pick up their tags first, when signaled, from the tag-in/weight-in dock. The boats that are tied in the gas dock area will pick their tags up at the gas dock next, when signaled. The boats tied in the marina basin will pick up their tags at the tag-in/weight-in dock last, when signaled. All boats will proceed without passing down the river to Lake Superior and wait on Lake Superior along the beach area south of the mouth of the river. NO FISHING AT THIS TIME!! The official start of the Derby will be when the Official Boat blows its horn and fires the signal flare. In the event of a change in the Derby fishing times, the weight-in times will be one hour after the official lines up call and the deadline for picking up[ your fish will be one half hour (1/2) hour later. Any fish not picked up by the designated time will be forfeited. All participants should be at Buck’s Marina by 3:00 pm on Friday to attend the PRE-DERBY meeting. Fishing area will be on Lake Superior only. Exterior boundary will be an imaginary line from Miniconning Point across to Brule Harbour. All entrance must be in possession of a valid Ontario fishing license and/or comply with OMNR fishing regulations. Eligible fish to be entered into the Wawa Salmon Derby will be Pink Coho and/or Chinook Salmon. There will be a special category for Lake Trout and prizes will be awarded for Lake Trout. The Lake Trout category has a 3 lb minimum entry weight. Lake Trout do not count in the total weight category and only three Lake Trout per day per team may be entered in the category. The mystery weight category has no minimum entry weight. Eligible fish entered in the Wawa Salmon Derby must be freshly caught on a hook and line and retrieved by rod and reel from a boat within the said boundaries. All fish must be entered FRESH, not frozen, WHOLE, not gutted; no gaffed, snagged or foul-hooked fish will be eligible for prizes. Registration fee is per two-person team. There may be more than one team per boat. A one-person team may enter, however, the full registration fee will still apply. If a boat has a two-person team registered, a one person team may enter for ½ the entry fee of a two-person team. 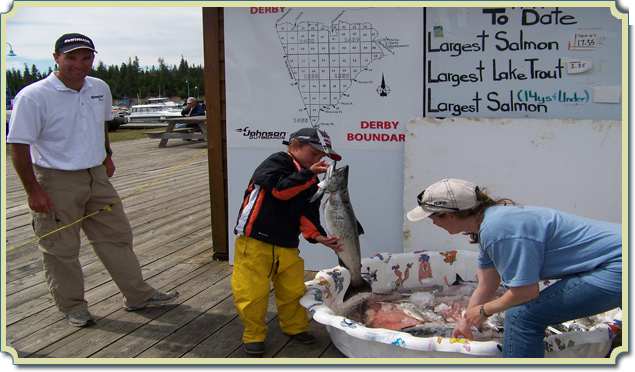 The winning fish will be judged according to weight in pounds and fractions of pounds as weighed on Official Derby Scales. The decision of the Derby Officials will be final. In the event of a tie for any of the prizes to be awarded, the first eligible fish to be weighed in will be declared the winner. There is no minimum age for participants, however, all minors (under 18 years) must be with a parent or legal guardian at all times during the tournament. All participants must wear life jackets or approved PFD’s while travelling other than drifting or trolling speed. It is mandatory that minors wear PFD’s at all times in the boat. All boats operating after dark must have functioning running lights of the type specified in the Canadian Government’s Small Vessel Regulations. If possible, all boats should be equipped with a “VHF” radio monitoring channel 68. THE TAG-IN TAG-OUT PROCEDURE – YOU MUST TAG-IN AND TAG-OUT!! For safety sake, you must tag in and tag out. The tag system is for your safety. When checking out before you go fishing, you must have your boat inspected and receive a tag with your team number. This tag allows your team to fish the Derby. You cannot enter caught fish without the tag. By returning the tag by boat each time you return from fishing we know you are off the lake. FAILURE TO RETURN THE TAG EACH TIME WILL RESULT IN DISQUALIFICATION!! When you wish to continue fishing, have your boat inspected and pick up your tag at the tag-in/weigh-in dock. When approaching the tag-in/weigh-in dock, always approach from the down river side. Boats in the gas dock area will pick up their tags at the gas dock in the morning on their way out. During the remainder of the day their tags are to be dropped off and picked up at the tag-in/weigh-in dock. Boats without any fish on board can drop their tags off at the entrance to the Marina Basin or at the official tag-in/weigh-in dock. NOTE: IF YOUR TAG IS NOT RETURNED IN BY 2:00 PM SUNDAY, YOU WILL BE AUTOMATICALLY DISQUALIFIED FROM NEXT YEAR’S DERBY. The no-wake zone is upriver of the red and white no-wake buoys. Remember, you are legally responsible for damage to other boats caused by the wake of YOUR BOAT! Derby Officials reserve the right to inspect boats at any time throughout the Derby under the boat owner’s supervision. Each entrant, upon registration who competes in the Derby, agrees to indemnify and safe harmless Wawa Salmon Derby Incorporated, their agents, employees, co-sponsors and event volunteers from any liability, loss, damage, injury or death, and all actions, suits, proceedings, costs, charges, damages, expenses, claims or demands that may arise from participating in this Derby. Each entrant agrees to have their mailing address and e-mail address kept on file for future Derby mailings. Entrants agree to co-operate with the press and agree that photographs taken during the Derby may be used without compensation or notice for the purpose of comments and promotion. All registered teams must prominently display their team numbers on the port and starboard side of the registered boat and be in possession of their tag when fishing – see rule #15 for tagging procedures. No passing in the river is recommended. All participants must do their utmost to exhibit good sportsmanlike qualities. During the Derby, any non-registrant(s) on board is/are not allowed to have any lines in the water. Only one line is allowed in the water per team member on board. Part of the Derby waters have a one line per person restriction while others allow two lines. The Derby one line restriction keeps it fair for everyone. Each entrant must abide by the Rules & Regulations of the Wawa Salmon Derby Incorporated. Any serious infractions of the rules, as deemed by Derby Officials, will be penalized by a one pound deduction from the weight of the largest fish for ach occurrence and automatic disqualification of team eligibility in the mystery weight prize category. An “insult policy” of $25 will be surrendered by claimant team to judges. The $ 25 fee will be returned if the decision is in favour of the claimant. If the decision of the judges (which is final and binding) is in favour of the defendant team, then the $25 fee will be forfeited to the Wawa Salmon Derby Incorporated and apologies in writing must be forthcoming by the claimant team. All registrants will be responsible for arranging their own dockage space with BUCK’S MARINA (705) 856-4488 prior to Derby times. The direction(s) of all Derby Officials must be observed. The decision of the Derby Official will be final. Participants must be in attendance and have their team id to receive their prize(s). A designee may accept your prize if they present your team id. No prizes will be shipped or held. In order to cancel, you must notify the Wawa Salmon Derby Incorporated IN WRITING (10) ten calendar days before the Derby. A fee of $20 will be non-refundable. The Derby Officials reserve the right to change the prize structure at any time. Any changes, additions or deletions to the official rules can be made by the Derby Officials at any time and should be announced at the 3:00 pm meeting on Friday. Derby Headquarters is located at Bucks Marina.